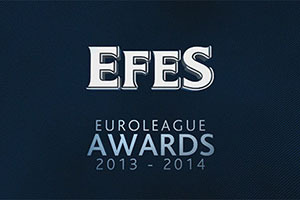 Excitement around the Euroleague Final Four but the 2013/14 EFES Euroleague Awards Ceremony has been the perfect starting point for the main event. The ceremony was a big success with the guests, players and officials at the Piazza Duomo in Milan having a brilliant night. Some of the players involved in the Final Four would have been on their best behaviour but it was definitely a night of celebration. 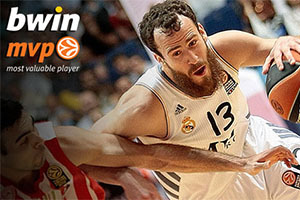 This was certainly the case for Sergio Rodriguez, the Real Madrid player who has had a fantastic season so far. In fact, Rodriguez has had such a fantastic season; he has picked up the 2013/14 bwin MVP award. This is richly deserved and it ensured that a Real Madrid player will pick up some silverware over the course of the weekend. However, Rodriguez and his team-mates will be going all out to ensure that there is plenty more cause for celebration in Milan for the boys from Madrid. Of course, there will be plenty of people looking to opposed Real Madrid, with Barcelona up first in a tantalising all Spanish semi-final at the Final Four. Rodriguez was on stage with the rest of the players who were listed in the All-Euroleague First Team. Making the first team is a fantastic accolade for players, even though Rodriguez was the star name of all of the big name European basketball players on Stage. Rodriguez was joined by his Real Madrid team-mate Rudy Fernandez and semi-final opponent Ante Tomic of FC Barcelona. Other players on stage include Sonny Weems of CSKA Moscow, who will be lining up in the semi-final against Maccabi Electra Tel Aviv and Keith Langford. Langford plays for Emporio Armani Milan and he was the winner of the Alphonso Ford Top Scorer Trophy. Other players were acknowledged at the event like Bogdan Bogdanovic from Partizan NIS Belgrade, who received the Rising Star Trophy for 2013/14. Another winner was Bryant Dunston who players for Olympiacos Piraeus, who was deemed to be the best defender in 2013/14. Both of these players showed their gratitude for the award by video. It’s an honour to be here with such great players. I want to thank my teammates, my club, Real Madrid and the whole organization. It helped us a lot to be together many years. We know each other a long time. Now to get the Euroleague title is our biggest goal. The 27 year old point guard has had an excellent career already but clearly he has a lot of time left in the game, and he’ll be hoping to pick up a Euroleague winners medal for this season. Rodriguez has extensive NBA experience having played for the Portland Trail Blazers, Sacramento Kings and the New York Knicks. Rodriguez was a member of the silver medal Spanish national team at the 2012 Olympics in London. Playing for a dominant Real Madrid side, it is no surprise to learn that Rodriguez has a good few winners medals in his locker, which means that Real Madrid have the experience to get over the line. Rodriguez has 1 Spanish league Champion medal, 2 Spanish King’s Cup medals and 2 Spanish Supercup medals at the starting point of the 2013/14 Final Four. He’ll be on the lookout for more team glory very shortly.